Get updates, commentary, and analysis as the Bruins take on the Montreal Canadiens in Game 6 of their Stanley Cup playoff series. Ken Albert. RT @gosoxgo2458 : @GlobeKPD who's announcing tonight? Bruins haven't clinched an Eastern Conference playoff series on the road since 2009, against, guess who, the Habs. Can change that tonight. Drove up today, introduced @cgasper to the wonders of Tim Hortons. Don't see Douglas Murray on for warmups. Looks like Michel Therrien quit drinking decaf. 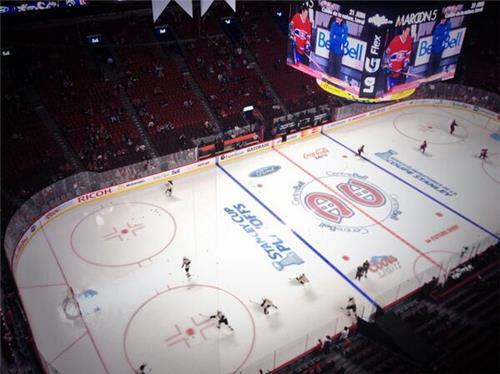 Douglas Murray not on the ice for the Habs as the teams are out for warmups. Third line will need to work a little harder tonight. Per MTL warmups: Pacioretty-Desharnais-Gallagher, Bournival-Plekanec-Vanek, Bourque-Eller-Gionta, Weise-Briere-Prust. 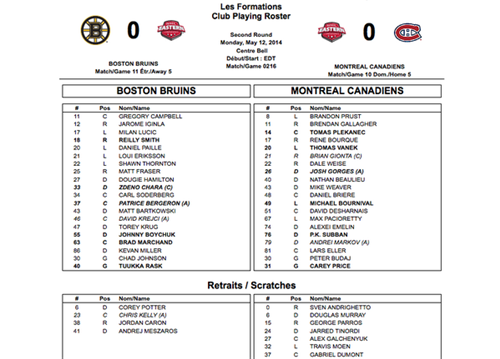 On D: Markov-Emelin, Gorges-Subban, Beaulieu-Weaver. Murray out. LRT: Third line to see mostly Beaulieu-Weaver tonight. Can they have the same kind of success? Per Bruins warmups: Lucic-Krejci-Iginla, Marchand-Bergeron-Smith, Fraser-Soderberg-Eriksson, Paille-Campbell-Thornton. #Canadiens have declared Game 6 a Murray-free Monday. On D: Chara-Hamilton, Bartkowski-Boychuk, Krug-Miller. Lineup is status quo. #fridgealert : Roughly 30 mins. to facoff, #Bruins Habs. Game 6. Mind the time. Smoke 'em if you got 'em. Son of #fridgealert : Make that roughtly 20 min.s to faceoff....twenty...vingt. 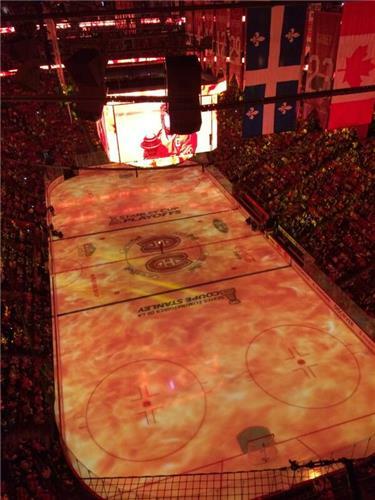 Bell Centre is probably a quarter full. The citizens of Montreal are outside, partying it up. Expecting raucous crowd. Pour joindre la conversation, utilisez le mot-clic #GoHabsGo ! / To join the conversation, use the #GoHabsGo hashtag! 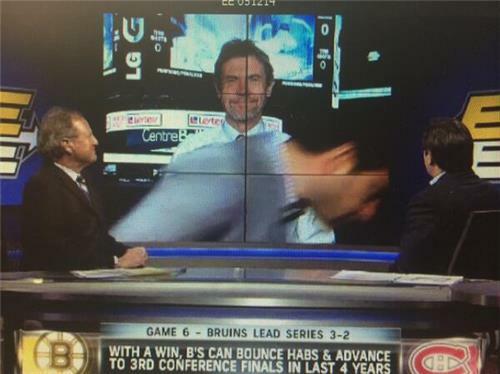 That whole Habs introduction thing Mike Felger was raving about. Yeah, it's pretty dope. Enjoying this presentation. Merci, Diesel. RT @GaryDzen : @GlobeKPD thanks Dupes! Enjoy the game. Bruins have taken the ice. And now we have the Habs, too. Here we go for Game 6. 21,273 all singing O Canada. Fantastic opening ceremony. 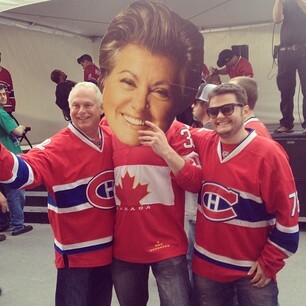 Habs fans riled up, singing along, and ready to square off. Let's go.